Jewelry displays are not simple supports: they are visual marketing tools. Discover how you can take advantages of them. Necklaces and bracelets themselves are a pleasure for eyes: why don’t you make them even more sparkling with elegant jewelry displays? According to the collective imagination, selling jewels is easy: they are already beautiful, so exposing them in a showcase it’s enough! But this idea is completely incorrect! Jewels, being luxury goods and not essential products, are not particularly required, except during anniversaries and other recurring events. Precious objects, in short, need a little selling incentive, such as jewelry displays, which make them, even more special. As a nice pair of eyes can only be highlighted with a brilliant makeup, so your jewelry will only become even more valuable with To Be Packing jewelry display stands! Jewelry displays, in fact, aim to give life to your precious products and transform your store, into a real gem! It’s not sufficient to choose a whatever stand to give light to your jewelery: it is necessary to use displays that, in addition to enhancing jewels, seek to highlight their personality. But to set up efficient showcase, it is essential to study a visual strategy which does not leave anything to chance. What I want to tell with my showcase? Each jewelry has, at least, one strong point that makes it, unique in the commercial overview. Trying to reach all kind of target is utopian and it’s an unnecessary waste of time: you’d better select a target to hit with your products and just focus on that, without wasting precious energy. 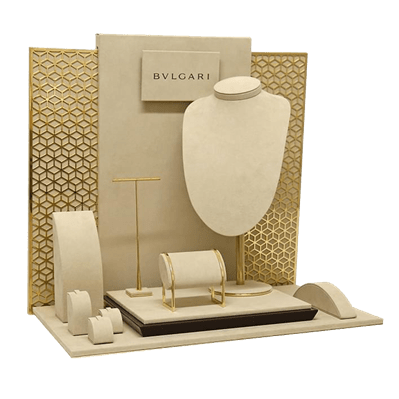 Jewelry display stands can be a business card of a store, since they represents the first approach a customer has with your jewels: in short, a showcase intelligently prepared can make a difference and increase potential visits. Who buys jewelry, does not settle for going into a store, but to immerse himself into a magical world: that’s why jewels exposition has to tell a great story. 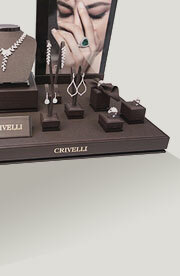 Jewelry displays should not only show products, but they have to stimulate the imagination of a potential customer. Jewels need the right light to shine in the eyes of those who watch them! It is not necessary to position spotlights in every inch of the showcase: earrings have to shine, not the eyes of the observer! • Do not direct the light downwards, for not creating annoying shadows. 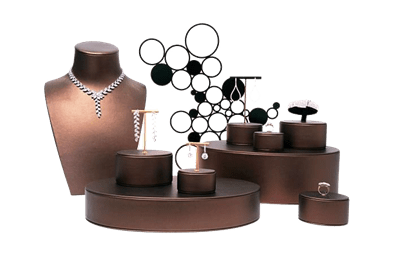 Do not fill jewelry displays with all the products you have in your store: you simply have to suggest some ideas about what your jewelry offers. Bulking products of all types, in fact, makes the view unpleasant: remember that the showcase is not a product catalog. Good taste always pays and the correct combination of colors is certainly not an exception. Therefore, it is, fundamental not only to create a chromatic harmony, but also to reflect the style of the store to maintain a certain coherence between the showcase and the jewelry. Colors are important because they act on unconscious level, arousing feelings and emotions in those who observe them: do not underestimate them! When you organize products on a jewelry display stands, you have to concentrate on a focal point in which to place your flagship jewels. The focal point is central at a height of about 1.5 meters; then, the eye will tend to move, first of all, to the right of the focal point and then to its left: knowing this, you can adjust jewelry disposal. Throughout a year, there are lots of celebrations and festivities which can be exploited to create special and magical atmosphere. The layout should be studied, at least, 14 days earlier than the event: creating a schedule will help you to organize everything! It would be better to renew the showcase, at least, once a month to avoid the risk of boring all the customer who spend every day in front of your store. To Be Packing, world leader in the packaging industry, offers a wide choice of products, all made in Italy. 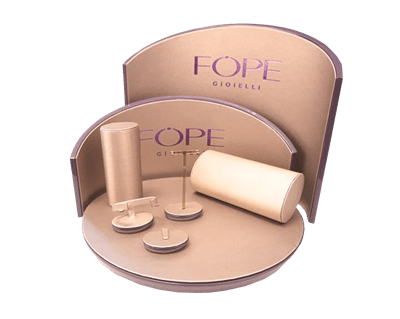 To Be Packing designs and manufactures custom packaging dedicated not only to the jewelery industry, but also to the cosmetic, food & wine and fashion sectors. 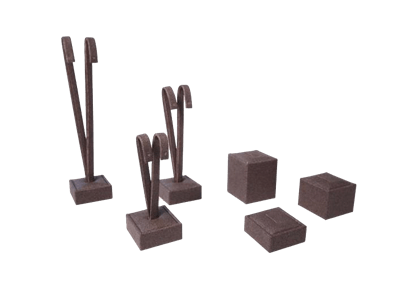 Made with the highest quality materials and characterized by an elegant and sophisticated design, our jewelry display stands will transform your showcases into gems. They can also be customized in colors and materials: in this way, you will have a unique piece. 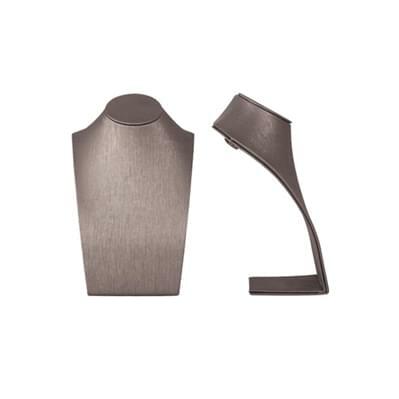 LIGHT NECK: elegance and lightness are the features which characterize this original jewelry display. Perfect for thin chain necklaces, Light Neck can be customizable, both in colors and materials. PARIGI EXPOSITORS: a complete set consisting of oval stands for bracelets, earrings and rings. Its smooth flowing lines will make your jewelry, even more sensual. CUBETTO / CUBETTO TOP EXPOSITORS: this is one of To Be Packing bestsellers, thanks to its classical and minimalist design. It can be adapted to any style! Have you already chosen a style for your store?